Put two rookie traders in front of the screen, provide them with your best high-probability set-up, and for good measure, have each one take the opposite side of the trade. More than likely, both will wind up losing money. However, if you take two pros and have them trade in the opposite direction of each other, quite frequently both traders will wind up making money - despite the seeming contradiction of the premise. What's the difference? What is the most important factor separating the seasoned traders from the amateurs? The answer is money management. Like dieting and working out, money management is something that most traders pay lip service to, but few practice in real life. The reason is simple: just like eating healthy and staying fit, money management can seem like a burdensome, unpleasant activity. It forces traders to constantly monitor their positions and to take necessary losses, and few people like to do that. However, as Figure 1 proves, loss-taking is crucial to long-term trading success. Figure 1 - This table shows just how difficult it is to recover from a debilitating loss. Note that a trader would have to earn 100% on his or her capital - a feat accomplished by less than 1% of traders worldwide - just to break even on an account with a 50% loss. At 75% drawdown, the trader must quadruple his or her account just to bring it back to its original equity - truly a Herculean task! 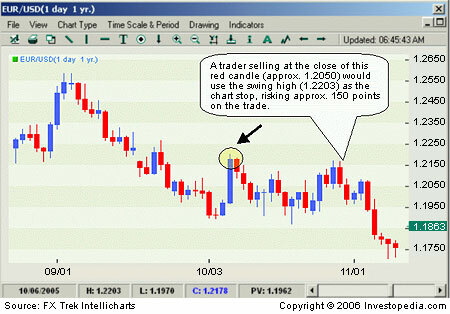 Although most traders are familiar with the figures above, they are inevitably ignored. Trading books are littered with stories of traders losing one, two, even five years' worth of profits in a single trade gone terribly wrong. Typically, the runaway loss is a result of sloppy money management, with no hard stops and lots of average downs into the longs and average ups into the shorts. Above all, the runaway loss is due simply to a loss of discipline. Most traders begin their trading career, whether consciously or subconsciously, visualizing "The Big One" - the one trade that will make them millions and allow them to retire young and live carefree for the rest of their lives. In FX, this fantasy is further reinforced by the folklore of the markets. Who can forget the time that George Soros "broke the Bank of England" by shorting the pound and walked away with a cool $1-billion profit in a single day? But the cold hard truth for most retail traders is that, instead of experiencing the "Big Win", most traders fall victim to just one "Big Loss" that can knock them out of the game forever. Traders can avoid this fate by controlling their risks through stop losses. In Jack Schwager's famous book "Market Wizards" (1989), day trader and trend follower Larry Hite offers this practical advice: "Never risk more than 1% of total equity on any trade. By only risking 1%, I am indifferent to any individual trade." This is a very good approach. A trader can be wrong 20 times in a row and still have 80% of his or her equity left. The reality is that very few traders have the discipline to practice this method consistently. Not unlike a child who learns not to touch a hot stove only after being burned once or twice, most traders can only absorb the lessons of risk discipline through the harsh experience of monetary loss. This is the most important reason why traders should use only their speculative capital when first entering the forex market. When novices ask how much money they should begin trading with, one seasoned trader says: "Choose a number that will not materially impact your life if you were to lose it completely. Now subdivide that number by five because your first few attempts at trading will most likely end up in blow out." 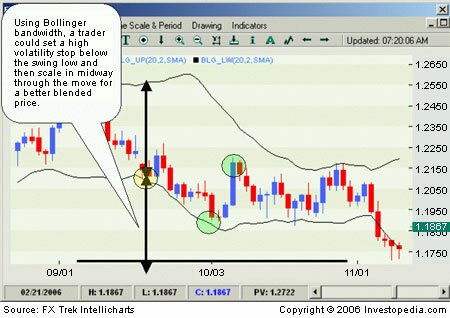 This too is very sage advice, and it is well worth following for anyone considering trading FX. Once you are ready to trade with a serious approach to money management and the proper amount of capital is allocated to your account, there are four types of stops you may consider. This is the simplest of all stops. The trader risks only a predetermined amount of his or her account on a single trade. A common metric is to risk 2% of the account on any given trade. On a hypothetical $10,000 trading account, a trader could risk $200, or about 200 points, on one mini lot (10,000 units) of EUR/USD, or only 20 points on a standard 100,000-unit lot. Aggressive traders may consider using 5% equity stops, but note that this amount is generally considered to be the upper limit of prudent money management because 10 consecutive wrong trades would draw down the account by 50%. One strong criticism of the equity stop is that it places an arbitrary exit point on a trader's position. The trade is liquidated not as a result of a logical response to the price action of the marketplace, but rather to satisfy the trader's internal risk controls. Technical analysis can generate thousands of possible stops, driven by the price action of the charts or by various technical indicator signals. Technically oriented traders like to combine these exit points with standard equity stop rules to formulate charts stops. A classic example of a chart stop is the swing high/low point. In Figure 2 a trader with our hypothetical $10,000 account using the chart stop could sell one mini lot risking 150 points, or about 1.5% of the account. A more sophisticated version of the chart stop uses volatility instead of price action to set risk parameters. The idea is that in a high volatility environment, when prices traverse wide ranges, the trader needs to adapt to the present conditions and allow the position more room for risk to avoid being stopped out by intra-market noise. The opposite holds true for a low volatility environment, in which risk parameters would need to be compressed. One easy way to measure volatility is through the use of Bollinger bands, which employ standard deviation to measure variance in price. 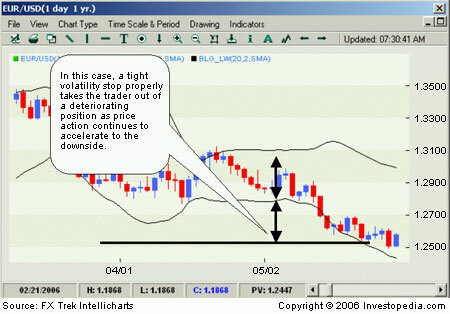 Figures 3 and 4 show a high volatility and a low volatility stop with Bollinger bands. In Figure 3 the volatility stop also allows the trader to use a scale-in approach to achieve a better "blended" price and a faster breakeven point. Note that the total risk exposure of the position should not exceed 2% of the account; therefore, it is critical that the trader use smaller lots to properly size his or her cumulative risk in the trade. This is perhaps the most unorthodox of all money management strategies, but it can be an effective method in FX, if used judiciously. Unlike exchange-based markets, FX markets operate 24 hours a day. 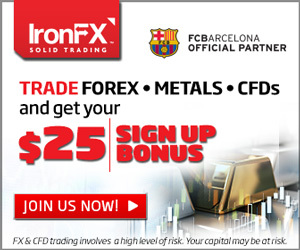 Therefore, FX dealers can liquidate their customer positions almost as soon as they trigger a margin call. For this reason, FX customers are rarely in danger of generating a negative balance in their account, since computers automatically close out all positions. This money management strategy requires the trader to subdivide his or her capital into 10 equal parts. In our original $10,000 example, the trader would open the account with an FX dealer but only wire $1,000 instead of $10,000, leaving the other $9,000 in his or her bank account. Most FX dealers offer 100:1 leverage, so a $1,000 deposit would allow the trader to control one standard 100,000-unit lot. However, even a 1 point move against the trader would trigger a margin call (since $1,000 is the minimum that the dealer requires). So, depending on the trader's risk tolerance, he or she may choose to trade a 50,000-unit lot position, which allows him or her room for almost 100 points (on a 50,000 lot the dealer requires $500 margin, so $1,000 – 100-point loss* 50,000 lot = $500). Regardless of how much leverage the trader assumed, this controlled parsing of his or her speculative capital would prevent the trader from blowing up his or her account in just one trade and would allow him or her to take many swings at a potentially profitable set-up without the worry or care of setting manual stops. For those traders who like to practice the "have a bunch, bet a bunch" style, this approach may be quite interesting. As you can see, money management in FX is as flexible and as varied as the market itself. The only universal rule is that all traders in this market must practice some form of it in order to succeed. Boris Schlossberg is the Senior Currency Strategist at Forex Capital Markets in New York, one of the largest retail forex market makers in the world. He is a frequent commentator for Bloomberg, Reuters, CNBC and Dow Jones CBS Marketwatch. His book "Technical Analysis of the Currency Market ", published by John Wiley and Sons, is available on Amazon, where he also hosts a blog on all things trading.